Guided by the fact that there is no small and irrelevant, but one and only life, director Andrea Cakic and editor Iva Blaskovic have made a documentary film The Invisibles in association with the excellent team from Croatian Radiotelevision. 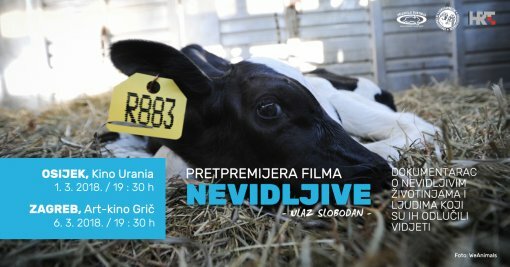 The movie will be premiered on March 1st at 7:30 PM in the Osijek's cinema Urania (Vjekoslava Hengla Promenade 1) organized by the Association Victories (Pobjede). A few days later, on March 6th, 2018, at 7:30 PM, the film will be screened at the art cinema Gric (Jurisiceva 6) in Zagreb organized by the Animal Friends Association. Film The Invisibles speaks in a very memorable way about the invisible animals and people who noticed them. For the premiere, the scriptwriter and director of the film states: "They are all around us, only we don't notice them because they are invisible, hidden. They now have another form; form of food, clothes, cosmetics... so we don't know they are here. They are our fellow citizens because they live behind the walls of industrial farms on the outskirts of our cities, behind those tall walls and we never get to see them because they only get to go out once... Even in this film they will remain more or less invisible because behind these walls recording is not allowed, compassion is not allowed... That is why people will tell the story for Invisible, people who have decided to see them, not as products, but as conscious beings who suffer, rejoice and want to live just like we do. The protagonists of this documentary will tell us how they succeed without consuming animal products, how they still are top athletes, travel around the world, enjoy their food and their lives by respecting the life of others." The entrance to the Urania cinema on March 1st at 7:30 P.M. will be free thanks to the City of Osijek, the patron of the projection. The entrance to Gric cinema on March 6th is also free thanks to the beautiful cooperation of Animal Friends Croatia association and Art Cinema Gric. The film was made by: writer and director Andrea Cakic, editor Iva Blaskovic, directors of photography Damir Bednjanec and Darko Halapija, producer Mate Culjak, and Pero Istvancic was in charge of music.